The Denver area is a region in Colorado, a state of the United States of America. It is centered on the city of Denver, Colorado's capital and largest city, but includes some outlying areas as well. South, by South Central Colorado. West, by South Central Colorado and the Front Range. North, by Boulder and Weld Counties. East, by the Eastern Plains. Region boundaries in Colorado are indistinct, and sometimes contentious. If you're looking for a destination/attraction that you think should be in this region, but can't find it, check the pages for South Central Colorado, Eastern Plains, and Front Range. See also the Front Range and South Central Colorado regions for other cities on the fringe of the Denver metropolitan area. Denver International Airport , (IATA: DEN, ICAO: KDEN). Commonly referred to as DIA. 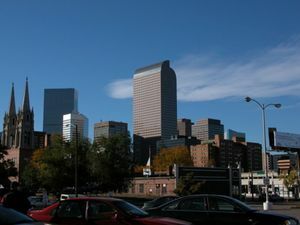 It is located about 20 miles to the east of downtown Denver. Frontier Airlines, United Airlines, and Southwest Airlines all maintain hubs at the airport in Concourses A, B, and C respectively. Most other major domestic carriers also have service here. Information can be obtained by calling (303) 342-2000.